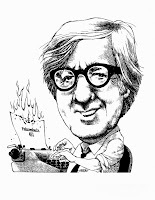 Ray Bradbury, master of science fiction and fantasy, has died at the age of 91. I don't think Bradbury is fully appreciated for the literary giant he really is. Most people recognize Fahrenheit 451 as a masterpiece of dystopian fiction (even though Mr. Bradbury himself denied that the book was about censorship at all). Many are familiar with The Martian Chronicles, as well. While I love those books, I think what often gets overlooked when discussing Bradbury are his short stories. Can anyone who has ever read "The Veldt" forget it? How about "The Illustrated Man"? I have no idea how many short stories Bradbury wrote in total, but I do know that I have one of his short story collections that could be used as an anvil. And almost every single story is a gem. I've taught Bradbury, as well. While his vocabulary can be challenging for younger teens at times, his sense of wonder and astonishment at the world as it as and the world as it could be enthralled many of my students. He never won the Pulitzer prize, which is a shame. Still, I think his stories will live on far longer than those of many prize winners. Now that he's gone, scholars can consider his place among the giants. They'll see a lot of writers sitting on his shoulders.